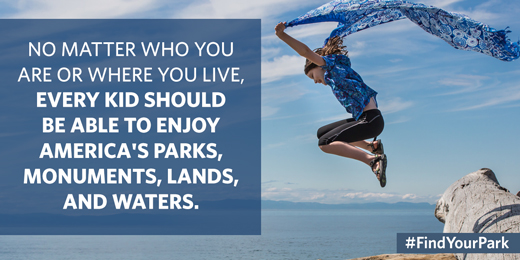 President Obama is giving the gift of nature to all fourth graders and their families with free admission to national parks and other federal lands for a full year. The Every Kid in a Park initiative is part of an effort to get schoolchildren outdoors and more active. It will start in the school year that begins next fall, which coincides with the 100th anniversary of the National Parks Service in 2016. 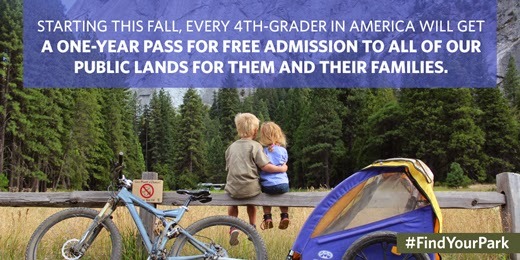 Every Kid in a Park joins the Foundation's Open Outdoors for Kids program in helping children learn history, culture, and science while exploring the great outdoors. The initiative is an administration-wide effort among the National Park Service, Forest Service, Department of Education, Army Corps of Engineers, Bureau of Land Management, Fish and Wildlife Service, Bureau of Reclamation, and National Oceanic and Atmospheric Administration. The White House also announced it will help schools and families arrange trips to the parks "by providing key trip-planning tools and helping to cover transportation costs for schools with the greatest financial need." The National Park Service is launching a revised education portal featuring more than 1,000 materials developed for K-12 teachers, including science labs, lesson plans, and field trip guides. With this kind of support, we can help our children become lifelong learners -- both inside and outside the classroom.